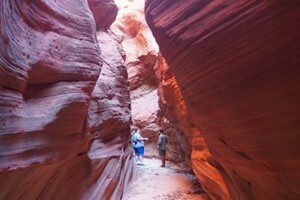 Keyhole Canyon is perfect for beginner canyoneers to try out the sport for themselves. There are few moves that are technically challenging, while still providing a fun and exciting hike. The hike is only a couple hours in total, with little down-climbing. There is convenient access to the canyon from Highway 9. Keyhole Canyon has just about everything to get a beginner canyoneer excited and ready to explore some of the bigger canyons. Just two hours in length, the narrow slot canyon has multiple rappels and some channel swimming, while minimizing the technical down-climbing and hiking time. The narrowness of the canyon makes the water extremely cold, so a wetsuit is a general requirement even in the hottest of summer days. Once you drop into the pools and feel the freezing water, you'll appreciate the fact that your wore it! 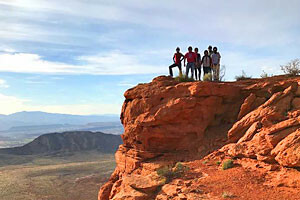 The Keyhole Canyon trip is a classic, plain and simple. With convenient access from Highway 9, the number of "wow" moments and exciting maneuvers couldn't be greater in such a small space. The entire route is a highlight reel. For access to Keyhole Canyon, Zion requires a backcountry permit, so be sure to make a reservation online at http://zionpermits.nps.gov/ or call (435) 772-0170 for more information.